(Photo: REUTERS / Amit Dave)Muslims offer prayers on the occasion of Eid al-Fitr at a mosque in the western Indian city of Ahmedabad July 29, 2014. The Eid al-Fitr festival marks the end of the holy month of Ramadan. New York City Mayor Bill de Blasio has received high praise from city residents of Indian Muslim origin for his efforts during the latest Eid-ul-Fitr celebrations. Also known as the "festival of breaking of the fast", Eid is an important religious holiday celebrated by Muslims worldwide that marks the end of the fasting holy month of Ramadan. Every Eid, most Indian Muslims in the United States miss the pomp, celebrations, sounds, aromas, food, festivities, and the people of India, the Times of Indian editorialized July 17, the day the celebrations began. "There is nothing like celebrating Eid ul Fitr and Eid ul Adha in India," said the newspaper. But it hailed a March announcement by New York Mayor de Blasio who announced that the largest U.S. city, will close it's school system (that serves 1.1 million students), to celebrate Eid Ul Fitr and Eid ul Adha. "It really made us feel completely at home here in the US. Other States including New Jersey, Massachusetts and Vermont already celebrate both Eids. The Times of India noted that at the March 2015 press conference, Mayor de Blasio stated: "I am proud to say that this now makes New York City the largest school district in the nation to take this action, so this is a historic moment for our country as well. "This is about respect for one of the great faiths of this earth - 1.6 billion Muslims around the world. "The Muslim faith is one of the fastest growing in this nation and in this city, and many, many city students celebrate Eid al-Fitr at the end of Ramadan and Eid al-Adha at the end of the annual pilgrimage to Mecca." David Dinkins, an earlier NY mayor, had passed a law suspending city parking regulations for six days each year - three days on Eid ul Fitr and three days on Eid ul Adha to facilitate the Muslims to park their cars on the crowded NY City streets. 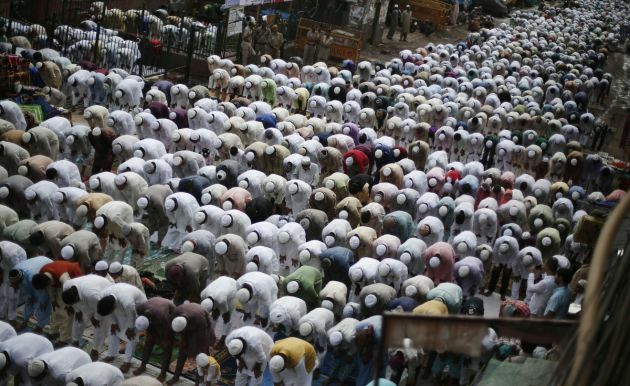 Muslims constitute about 13 percent of New York City's population, the Times of India reports. It cites a study by Columbia University said to show that about 10 percent of the NY City public school students are Muslim. On a drive through New York City, the ubiquitous Halal food carts, and the Hijab wearing young women underline the fact that Muslims have now made this City their home and hearth. The U.S. Postal system started issuing "Eid Mubarak," stamps on September 1, 2001, in Arabic calligraphy - another milestone noted for the Muslim community. There are now 2,106 mosques in the U.S.A, which also serve the communities other needs such as weddings, funerals, etc. Due to the rapid growth in Muslims' numbers, however, most of the mosques are now unable to host the number of worshippers during Eid. Many of the mosques therefore combine to pray in large buildings such as armories, hotel ballrooms, or in open parks.